“DSE” is an acronym of ‘Display Screen Equipment’. The term covers devices or equipment that has an alphanumeric or graphic display screen, regardless of the display process involved; it includes both conventional display screens and those used in emerging technologies such as laptops, phones, tablets and touch-screens. The regular use of computer workstations or equipment can be associated with neck, shoulder, back or arm pain, as well as with fatigue and eye strain. Surveys have found that a high proportion of DSE workers report such issues. These aches and pains are sometimes called upper limb disorders (ULDs), which can include a range of medical conditions such as RSI. Most of these conditions do not indicate any serious ill health, but it makes sense to avoid them as far as possible. Are there regulations which cover Display Screen Equipment use? Yes. 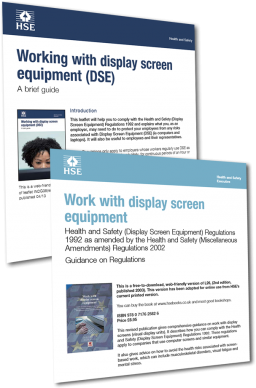 The Health and Safety (Display Screen Equipment) Regulations 1992 (revised 2002) were established to protect the health of people who regularly use DSE as a significant part of their normal work. These workers are known as DSE users. The regulations were introduced because DSE has become one of the most common kinds of work equipment. provide information, suitable equipment and training. identify who is covered by the Regulations. assess workstation risks and put control measures in place. Further reading on DSE Regulations can be found on this section of the Health and Safety Executive (HSE) website. What are the health risks with regular DSE use? That doesn’t mean that DSE work is risky – it isn’t. These issues can be avoided if users receive training on how to set up and use their workstations properly, and take breaks during prolonged use. With just a few simple precautions, work with DSE can be more comfortable and productive. Which areas should be investigated when conducting a DSE assessment? Work surface: suitable height. Adequate space for flexible arrangement of equipment/documents. Glare-free surface. Chair: stable and adjustable. Correct adjustment of the chair is essential. Leg room: clearance to allow for postural changes. Footrest: to be supplied if a user needs one. Screen: stable image and readable, adjustable height, glare/reflection-free. Keyboard: adjustable, detachable and legible. Mouse (if used): able to adjust position to suit user. Telephone (if used): able to adjust position to suit user. Hands-free headset may be necessary for heavy usage. Software: appropriate to task, adapted to user, no undisclosed monitoring. Lighting: adequate lighting to be provided. Window blinds may be required to minimise glare. Temperature & Environment: suitable for working in comfort. The Health and Safety Executive (HSE) website is an excellent source of information and advice on DSE and Workstation related issues.